It make dynamic loading and has comes with other suggestions for dynamic loading have included super-fast MUDs (Multi-User Domains also known as “Multi-User Dungeon”), where extra code could be compiled and linked into the running executable without having to stop and restart the program. This format has been selected by the Tool Interface Standards committee (TIS) as a standard for portable object files for a variety of (Unix-Like) operating systems. An ELF as at least two headers: the ELF header (Elf32_Ehdr/Elf64_Ehdr struct) and the program header (Elf32_Phdr/struct Elf64_Phdr struct). But there is also a header which is called the “section header” (Elf32_Shdr/struct Elf64_Shdr struct) and which describes section like: .text, .data, .bss and so on (we will describe them later). As you can see in figure 1, there is two views. Indeed, the linking view is partitioned by sections and is used when program or library is linked. The sections contain some object files informations like: datas, instructions, relocation informations, symbols, debugging informations, and so on. 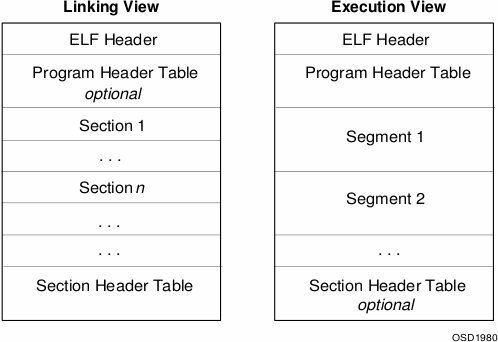 From the other part, the execution view, which is partitioned by segments, is used during a program execution. The program header as shown in the left, contains informations for the kernel on how to start the program, will walk through segments and load them into memory (mmap). The first 16 bytes represent the elf “magic” field, which is a way to identify an ELF file. But if bytes 1, 2 and 3 represent the encoded string “ELF”, what represent bytes 4, 5, 6, 7, 8, 9? We can affirmatively say, that our file is an ELF of class 64, encoded in little endian with a UNIX System V ABI standard and has 0 padding bytes. By the way, if you did not expected yet, we have compared to the structure we have observed here the “e_ident” of “Elf64_Ehdr” structure. We will use now one of the most used tool as “objdump” to analysis ELF files which is readelf from binutils to display every fields. That will simplify our analysis but if you are interested for dissecting ELF files yourself, you can look for libelf and we will also talk about some interesting libraries in Python to do it much more quickly. We already know the first line, but what can say about the three others? As you can see, in the second line, the first two bytes represent the “e_type”. Indeed, if you look at “elf.h” file, you could observe that “01 00” in little-Indian, means: “Relocatable file”. section headers with 29 headers, starting at byte (byte 40 – 43 in hexdump). For the rest, we will use readelf and I will let you finish the header part by yourself. section reserved for dynamic binaries (.got, .dynamic, .plt). After the address column, you have the offset within the file of the section, then you have the size in byte of each section, the section header size in byte, the required alignment, the Flags (Read, Write, Execute), and so on. In this article, we will discover some important sections to target for any attack. For example, it means for “printf” we need to patch the offset 0x000000600fe0 from the beginning of the .plt section. As you can see, each program header corresponds to one segment where you can find sections into it. But how does it work? After relocations, the loader invokes all libraries INIT function and then jumps to executable’s entry point. In static, there is less thinks to say because the kernel only loads LOAD segments to the virtual addresses and then jumps to the entry points (easy eh?). For some more details (I think), you can see an old but very good article published in Linux Journal #13 about ELF dissection by Eric Youngdale. Once upon a the time, you where at home and waiting for the rain to stop. As always you “googled” for some interesting informations (of course!) and you found a kind of bible: Smashing the stack for fun and Profit. Identifying the stack address, putting your shellcode at the beginning, adding some padding and rewriting the EIP, you could see that we can execute anything we want while exploiting a stack overflow. But times have changed, and you’re now confronted to canaris, ASLR (Address Space Layout Randomization), no executable stack, RELRO (read-only relocations), PIE support, binary-to-text encoding, and so on. So trying to exploit a stack based overflow, you should be surprised by the fact your shellcode doesn’t produce what you expected, and that’s the power of the bit NX (NX = 0 → Execute, NX = 1 → No eXecute). As you can see, the only flags we got is the Read and Write ones. You can disable the eXecute flag using “execstack -s [binaryfile]” and see the difference (RWE). To bypass it, we can use a method called “Return-into-libc”. Endeed, we know that any program that includes libc will have access to its shared functions (such as printf, exit, and so on), and we can execute “system(“/bin/sh”)” to get a shell. Program exited with code 017. Then, we overwrite the return address with system() function’s address and follow it with the exit() function’s address. To finish, we put the address of “/bin/sh” (that you can retrieve from a memcmp() or an environment variable). Note: NX bit is only available in Physical Address Extension (PAE), but can be emulated by PaX or ExecShield. Moreover, we will see after on x86_64 platforms that “return-into-libc” doesn’t work because of the ABI specifications, and that’s probably a problem you’ve already encountered. To avoid attackers to execute a dangerous shellcode, people has created a concept named “ASLR” (Address Space Layout Randomization). Indeed, it is a technique to arrange the position of the stack, heap, text, vdso, shared libraries and the base address of the executable (when builded with Position-independent executable support). So if you try to execute any shellcode at a saved position, you’ll observe a little fail, because the shellcode isn’t executed (or you are very lucky) and you get the classic error for segmentation faults as we did not ended properly. But it’s not quite fun, is it? So, attackers have found some ways to bypass this kind of technique. Indeed, in older kernels, they saw the ESP points to the stack, and of course, the buffer is on the stack too. A technique using linux-gate’s instructions, that were static before the kernel 2.6.18, was used to retrieve the address of any interesting pattern “\xff\xe4” (“jump esp” on x86) in memory. Other techniques to bypass ASLR exist like Brute-force. fluxiux@handgrep:~$ gdb -q --batch -ex "p 0x7fffc5cfa180 - 0x7fff1964d1f0"
fluxiux@handgrep:~$ gdb -q --batch -ex "p 0x7fffc8505ed0 - 0x7fffba20bd30"
fluxiux@handgrep:~$ gdb -q --batch -ex "p 0x7ffff39cbc10 - 0x7fff6eb3aa90"
fluxiux@handgrep:~/aslr$ gdb -q --batch -ex "p 0x7fffaffcde50 - 0x7fff54800abc"
fluxiux@handgrep:~$ gdb -q --batch -ex "p 0x7fffdaf7d5fc - 0x7fff08361da0"
fluxiux@handgrep:~$ gdb -q --batch -ex "p 0x7ffffbe8326c - 0x7fff792120c0"
fluxiux@handgrep:~$ gdb -q --batch -ex "p 0x7fffed12acfc - 0x7fffa3a4f8f0"
Using this method, we could fill the buffer with return address, add a large NOP sled after the return address + the shellcode and guess any correct offset, to point to it. As you can see, the degree of randomization is not the same, but you can play with that. Of course, this attack is more effective on 32-bits and on older kernel versions. Unfortunately, this leak is partially patched since 2.6.27 according to Julien Tinnes and Tavis Ormandy, and these files seem to be protected if you cannot ptrace a pid. Anyway, there was any other way using “/proc/self/stat” and “/proc/self/wchan” that leak informations such as stack pointer and instruction pointer (=>ps -eo pid,eip,esp,wchan), and by sampling “kstkeip”, we could reconstruct the maps (see fuzzyaslr by Tavis Ormandy). Brute-forcing is always a very offensive way to get what you want, it takes time, and you should know that every tries recorded in logs. The solution is maybe in registers. strcpy(buffer, string); // Guys! It's vulnerable! By the way, don’t forget to disable the stack protector (compile as follows: gcc -fno-stack-protector -z execstack -mpreferred-stack-boundary=4 vuln2.c -o vuln2). Will see after what a canary is, but now, just let’s focus on ASLR for the moment. (Note that if you’re not sure, try with this payload: `python -c ‘print “A”*70+”B”*8’`). fluxiux@handgrep:~/aslr$ objdump -d ./vuln2 | grep "callq"
At “0x400604” could be great, we just have to replace the junk data (“A”) by NOP sled and a precious shellcode that fits on the buffer and we replace the instruction pointer by the address “0x400604”. On 32-bits, “Sickness” has written a good article about that if you are interested. But as you know, by default on Linux (especially the user friendly one: Ubuntu), programs are compiled with the bit NX support, so be lucky to use this technique on nowadays systems. Indeed, we use also an option to disable the stack protector, but what is it exactly? Named for their analogy to a canary in a coal mine, stack canary are used to protect against stack overflow attacks. Compiling with the stack protector option (which is used by default), each dangerous function is changed in his prologue and epilogue. If the value in “fs:0x28” is the same as in ”%rdx”, the “vuln()” function will end properly. In other case, the function “__stack_chk_fail()” will be called and an error message shows up (“*** stack smashing detected ***: ./vuln3 terminated ”). The first 2 kinds are easy to bypass, because you just have to fill the buffer with your shellcode, giving a desired value to be at the right position and rewrite the instruction pointer. But for the random one, it is a little more fun, because you have to guess its value at each execution (Ow! A kind like ASLR?). For random canaries, the “__gard__setup()” fills a global variable with random bytes generated by “/dev/urandom”, if possible. Latter in the program, only 4|8 bytes are used to be the cookie. But, if we cannot use the entropy of “/dev/urandom”, by default we will get a terminator or a null cookie. Brute-force is a way, but you will use to much time. By overwriting further than the return address, we can hook the execution flow using GOT entries. The canary will of course detect the compromising, but too late. A very good article covering the StackGuard and StackShield explain four ways to bypass these protections. However, on new kernels you also have to noticed that the random cookie is set with a null-byte at the end, and trying to recover the value from forking or brute-forcing will not work with functions like “strcpy”. So the better way to do that, is to have the control of the initialized cookie. Format string vulnerabilities or heap overflow for example, are more easy to exploit with this protection, but this article is not finished yet and we will see another memory corruption mitigation technique. The exploitation of a format string bug for example, using the format parameter “%n” to write to any arbitrary address like GOTs is suppose to fail. But as we noticed previously, PLT GOTs have “write” permissions and then we are face to a partial-RELRO only. fluxiux@handgrep:~/relro$ readelf -l ./fullrelro | grep "RELRO"
fluxiux@handgrep:~/relro$ readelf -d ./fullrelro | grep "BIND"
Note: BIND_NOW indicates that the binary is using full-RELRO. The entire GOT is remapped as read-only, but there are other sections to write on. GOTs are use mostly for flexibility. Detour with “.dtors” can be perform as Sebastian Krahmer described in his article about RELRO. We have seen common Linux protection used by default, but the evolution of kernels and architectures have made things more difficult. With time, the new versions of Linux distribution become well hardened by default. In my studies, the Ubuntu one surprised me a lot, because in addition to these protections implanted by default, this system turns to take some openBSD solutions to be as user friendly and secure as possible. Moreover, we have seen few protections and ways to bypass it, but the 64-bits give us other difficulties. As you notices, addresses have changed and it more difficult to exploit some memory corruption because of the byte “\x00”, considered as a EOF for some functions like “strcpy()”. We saw that NX is enabled and the compilation in gcc with its support are made by default. But the worst is coming. Indeed, we now that the randomization space is larger but what interest us, is the System V ABI for x86_64. I suggest you to read the slides Jon Larimer about “Intro to x64 Reversing”. We could use the knowledge of borrowed code chunks’ article that can help us to understand problems of NX, System V ABI x86_64 differences with x32, and ways to bypass them using instructions to write a value on one register, and call the function “system()”, for example, that will use this register as a parameter. Other sophisticated attacks like Return-oriented Programing are use to bypass these protection that make life difficult in an exploit process. As you could see, protections didn’t make things impossible, but just harder and harder. So be aware of new applied protections and conventions to not waste too much time. Excellent sum-up of ELF attack and defense, I really appreciated reading it. It just miss one little trick to workaround ASLR that I noticed under Linux. So, this is Linux specific and won’t work on any other POSIX system. Basically, it plays with processes personality flags to mark a process to be out of ASLR. The good thing is that it do not require to be system administrator to trigger it on and off. The bad thing being that it will break if you try to apply it to setuid programs (this is for obvious security reasons). So, the idea is that every process under Linux has ‘personality flags’ that are inherited by all its childs. And one of these flag is about having the ASLR activated or not. Triggering these flags is done through the command ‘setarch’ (read ‘man setarch’ to know more about it). I tell this trick to my students to practice and try out things on systems where they do not have root access. Hope this helped ! And keep going on this blog, it is really interesting and you are really good at writing. Nice trick perror =)! I didn’t know that. By the way, I think we can play with that to try if there are some weaknesses. Nice article, but I found one error. The program header is only required in executables. Object files and shared objects do not need it.